With the launch of Windows 10, things have changed drastically over the year, albeit for the good. It is now equipped with many new features than any of its previous versions. From desktop management to using multiple desktops, it has many unique features. But, with many features come many icons as well that may create a clutter on the desktop. So, if you are struggling to organize them, the best solution would be to get an app launcher. If you are wondering that’s just a petty addition, then you are just wrong. There are some major advantages of adding an app launcher to your desktop like being able to free some Desktop space, option to keep your favourite programs in the front and center for quick access, finding and opening files quickly, searching the web, and more. Here’s a list of the best app launcher for Windows that can help you make your choice. Its perhaps the most popular app launcher in the list. Rocket Dock has been around for quite some-time so, the probability is that you have used it previously on Windows XP already. But, the best part is, that it’s also compatible with Windows 10. This program launcher places itself on the top of your screen. The design of the launcher seeks inspiration from Mac OS X launch bar and its primary aim is to arrange your favorite shortcuts all at one place making it easier for you to access them always. On installation, the launcher will offer some default shortcuts, however, that can be easily modified, and even add any app or program you wish to. Best of all, it saves a significant space on desktop and this is especially useful for those who have several icons on the desktop. Launchy is a powerhouse app yet the simplest launchers around. It makes life easy by requiring no set up after installation. Simply launch the app by pressing the keyboard shortcut “Alt+Space”, key in the app name you wish to open, and select the one you have been looking for from the search results. The app has the ability to launch multiple programs. It can be used to open files and folders, perform web searches, carry out calculations, and even run shell commands. Its skin can also be customized, while the functions can be expanded using several plugins. Same as the Find and Run Robot, SlickRun focuses majorly on aliases, although this app is much more instinctive when it’s about setting it up and using it. It’s definitely one of the easiest to use app although with some compromises in the features. Overall, the app has a better balance in comparison. Some of its greatest advantages are that it can handle multiple tasks with the configuration you want. In addition, it can also run many commands, automated tasks and even perform batches to carry out more tasks. From executing multiple magic words, apps, or opening folders, or associating magic word to running windows app, to setting it to invisible, there are some unique features indeed that sets it apart from others. If you are looking for an uncomplicated app launcher for Windows, then Executor is definitely one of them that you can look upto. Its located in the taskbar, so all you need to do is to click on it, key in the name of the app you want to launch, and it will open. On the installation of this program, it starts indexing all apps and programs along with menu entries, list of recently used items, and so on. With less than 1MB in size, this is a very small app and so, it won’t take much of resources as it runs in the background. To avoid typing the full name, you can also set up a certain keyword for a program. Additionally, the app also works great with URLs which helps you to access a specific website quickly. ObjectDock is another popular app launcher for Windows that has been in the business for quite some time now. 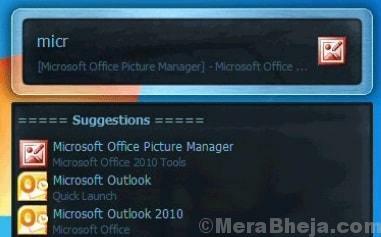 It offers you the option to add your favorite apps and programs to the launcher to access the programs quickly. It also allowed users of Windows 7 earlier to add Gadgets, but as we all are aware that the feature does not exist anymore. The app features simple design giving us an impression as if it’s sitting on a table. The launcher is located at the top the screen keeping any disruption off from the screen. It also allows you to add quick launch icons from the taskbar. This helps you with quick integration. It’s a versatile app which can do quite a bit. It may not differ much from the others in the category in terms of launching the application, but it does come with some unique features, such as the option to create sticky notes and carrying out extremely basic text expansion, which, even though is not essential, but is surely a cool feature. Some of its advantages are that it features over 80 well-known apps and shortcuts that have been pre-configured after installation of the app. This offered an easy experience for the users straight out of the box to get started. Wox is a fully featured app launcher for Windows that also helps you to access programs and web contents as you type. Among its major features are quick start program and finding local files and application without quitting your keyboard. It also sorts file automatically based on usage. It allows you to search the web by prefixing your search with keywords like, wiki, etc. You can also add your own web searches in the settings pane of the app that helps to meet your daily requirements. Not just that, creating a plugin is super easy with Wox. It supports plugins written by Golang, CSharp, and so on. It also allows you to use a theme that matches your desktop. You can even create your own themes by choosing your preferred colors, fonts, sizes, etc. RK Launcher is free just like the other app launchers for Windows 10. This app is used for saving your favorite apps and programs. It allows you to add any app you can think of, along with files and folders. The app sits on the edge of the screen, but not necessarily at the top edge since this can be moved to any side of the screen you wish to. The app features a clean and simple design that perfectly goes with your working environment. You can completely customize the appearance of the app by changing themes, adding custom icons and docklets. Given that the app can be settled on any side of the screen, and that it supports different apps, file types, and programs, it can be a great alternative to the taskbar. Despite the fact that RK Launcher has been around for quite some time now and it was available for previous versions, it still works with Windows 10. Find and Run Robot is one of the most dynamic apps in the category that comes with several alias functions, plugins, and settings. These features allow you to customize most of how it functions. Considering that’s it highly advanced, it’s slightly more challenging to set up in comparison. However, it’s works great for those with specific requirements. Its biggest disadvantage is that it does not index at all that can be beneficial to keep the usage of the resources low, but it makes finding things much slower. However, on the brighter side, an adaptive search that tracks the user searches, makes it easier and quicker to find an app that has been launched previously, the next time you want to search and make use of it. It’s flexible, fast, leaves small memory footprint, comes with plenty of plugins, calculator with history tape and much more. This free app launcher seeks inspiration from the Apple’s operating system, Mac OS X lion. It starts minimized in the background, just like the Circle Dock and all you need to do is to enable it by pressing the keyboard shortcuts “Shift + Tab”. On activation, the launcher bar opens up, and displays the list of all apps and programs that have been pinned. The moment the WinLaunch pops up, the desktop icons are concealed and the background is blurred give it a nice look. It allows you to club the shortcuts in groups just at it is done in iOS. To create a group, you simply need to drag and drop an icon into the other. It allows you to create as many groups as you want and make customization further, for instance, adding the group name. What we like is its ‘Jiggle Mode” that allows you to shift icons from one group to another. If you wish to add icons to the app, you must click “F” on your keyboard. The launcher will be then be reduced to a smaller window that can be moved and where you can add icons by using the drag and drop option. Enso carries out its job in a manner which is quite different from the other app launchers. Here, you need to hold down the Caps Lock key, instead of hitting a key combo. You must then type the command and let go the Caps Lock to enable it. Alternatively, you can also enable it in a more conventional manner and that’s what sets it apart from the others in real. The best part is, you slowly get used to the way it functions. It also allows you to add aliases which is called “favorites” here, and move over to any open program using its “go” command. Keypiranha is a fast app launcher for Windows that quickly finds and launches a world of items such as, files, bookmarks, applications, registry keys, URLs, sessions, and more. Additionally, it also performs actions like searching web queries, and even evaluates mathematical expressions, using the just the keyboard. Among its other major features are, starting a search on any configured website or online dictionary, translation languages on the go, base converting numbers, searching the environment variables, initiating a copied URL directly, splitting a URL and converting its arguments to Jason, change to a running application by name, hash a string, and much more. XWindows Dock looks a lot like the MacOS’ launcher toolbars, and provides you with options that are also available in Apple’s tool. What’s interesting about this launcher is that it lets you customize completely. You can customize and change its looks by adding graphic effects in the form of transparency, shadow, reflections, blur, etc. But, apart from its sleek look, it also offers some unique features. It not just allows you to add your favorite apps and programs, but also a few other Windows features. The plugin manager can also be used to add a few custom plugins to the interface such as, a stack container same as the Stacks Docklet that appears in the RocketDock. Listary is another app launcher that does a lot more than just launching an app or program. While it makes the entire process easier helping you browse through folders, looking for the right file names, or looking through the Windows limited menus, it also applies a smart search technology that allows you to keep working without having to go through the hassles of the tedious native Windows navigation. Featuring a lightweight interface that doesn’t slow your system down or strain the system resources, Listary puts the Windows Explorer on steroids. Moreover, for heavy users, the app blends with your favorite tools like the WinRAR, Total Commander, Xplorer2, Directory Opus, and more. So, get your free app launcher today for your Windows and optimize your desktop experience to the max.